It is said that experience is a great teacher. When it comes to having your septic system installed or serviced by someone without a lot of experience, you will be taught a very expensive lesson. Don’t take chances on something so important; call our highly experienced septic and wastewater system experts at Southern Water and Soil. We have over 30 years of combined experience in septic and wastewater projects throughout Florida. As a full service solution company, we manage every part of your installation, including permit application services, septic system engineering services, septic system installation services, and even septic and aerobic system maintenance, for years to come. We strive to educate our customers about their systems, so we will be sure you know everything there is to know about how to keep your system operating properly. We have gained our education and work experience from the best: the Department of Health, Department of Environmental Protection, and the Southwest Florida Water Management District. You can rest assured that your system will meet or exceed all requirements for our area, including those requirements dictated by authorities in Tampa, FL and other surrounding cities and townships. 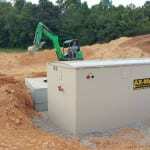 We provide both residential and commercial septic services. Besides installation, we perform drain field or septic tank replacement and repair, as well as any maintenance your system needs. One of our passions is the protection of Florida’s waters, and to that end, we focus on finding solutions to your wastewater needs that are not detrimental to our environment. We keep up with the newest technologies designed to protect our beautiful state. Give us a call so we can provide you with a quote for taking care of your septic and wastewater needs. We are happy to accept emergency calls, and we offer discounts to seniors, the military and teachers. Let our years of experience be your great teacher! Check out the feature article in National Onsite Installer!